Assalaamualaikum warahmatullahi wabarakatuh.In the Name of Allah, Most Gracious,Most Merciful. 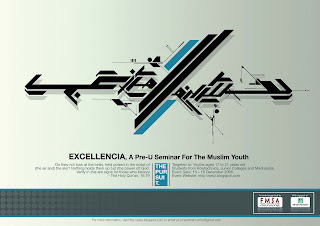 Welcome to The Fellowship Of Muslim Students Association and welcome to our blog site! This is where we hope students will be able to interact with one another, gain useful knowledge and get connected with FMSA and our activities. Formally known as Muslim Fellowship of Singapore (Persatuan Muslimin Singapura-PERMUSI) in 1983,the association was pioneered by a group of Muslim graduates and undergraduates of National University of Singapore and Ngee Ann Polytechnic. In 1994, PERMUSI / FELLOWSHIP was transformed into a full-pledged student organization called Fellowship of Muslim Students Association (FMSA). The Organising Committee for would like to extend its invitation to all students in JC, Poly and Madrasahs for the event, which will be held from 15 Dec 08 (Mon) to 18 Dec 2008 (Thu) @ Yusof Ishak House, National University of Singapore (NUS). The seminar serves as an intellectual platform for Muslim students to enliven an enriching experience about excellence and its significance in their lives. Participants will go through a 4 day 3 night residential programme that will enrich them intellectually, physically and spiritually. It is hoped that this seminar will give students the drive to pursue excellence in all that they do, and motivate them to carry on forth from the seminar to attain excellence in life. Through the avenues of forums, an outdoor experiential learning programme, as well as an outdoor project, participants will inculcate the attitude of perceiving excellence in every aspect of their lives. Participants will play a crucial and integral role in this process as they engage in these activities. Their findings will ultimately be the source of knowledge that will hopefully propel them further in pursuing excellence. For further details, you may reach us at +6590681887 or via email at fellowship@singnet.com.sg . Do note that the deadline for registration is 29th Nov 08(Sat). Participants are required to pay a registration fee at a subsidized rate of $20. We look forward to your positive response and eagerly await your participation in this worthwhile endeavour. Help us to fulfil this vision and make Excellencia: The Pursuit a success! BRMY'08 Forum: "My World, My Anchor"
WEB LINK : FMSA Facebook. Sign Up!